Leader of Grand Alliance have also been stating that a public announcement about the seat-sharing arrangements will be made only after January 14. 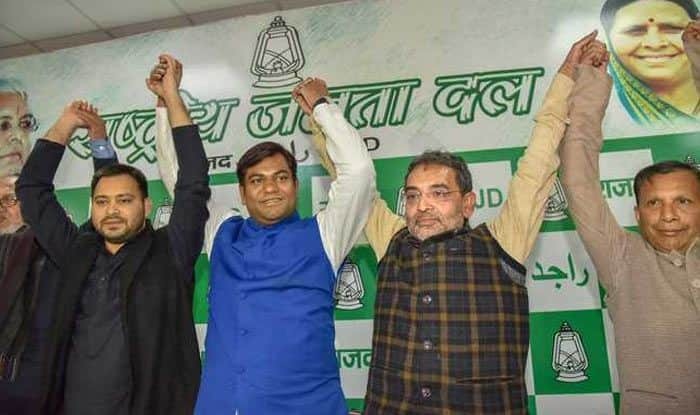 Patna: The ‘Mahagathbandhan’ (Grand Alliance) of the opposition in Bihar is ready to set the ball rolling for the upcoming 2019 Lok Sabha elections, with the first formal deliberation expected to be held during a meeting on Monday at the residence of RJD leader Tejashwi Yadav in Patna. The meeting is likely to be attended by all constituents of the ‘Mahagathbandhan’ that comprises the RJD, the Congress, former Union minister Upendra Kushwaha’s RLSP, former chief minister Jitan Ram Manjhi’s HAM and veteran socialist leader Sharad Yadav’s LJD. Tejashwi Yadav is the leader of the opposition in the state assembly. According to sources in the Grand Alliance, the meeting will be marked by “broad discussions on the respective number of seats to be fought by each constituent, and identifying constituencies best suited for each alliance partner”. They, however, added that a final agreement may be deferred till the release of RJD supremo Lalu Prasad serving sentences in fodder scam cases judgement on whose bail application has been reserved by the Jharkhand High Court. Moreover, leaders of the Grand Alliance have also been stating that a public announcement about the seat-sharing arrangements will be made only after January 14, when the inauspicious month of ‘Kharmaas’ comes to an end. Meanwhile, Jitan Ram Manjhi rubbished reports that have appeared in a section of the media, claiming that he was toying with the idea of a possible return to the NDA, as he was not getting his due in the Grand Alliance. “This is nonsense. Only on Saturday I was in Ranchi to meet Lalu Prasad. It is another thing that because of his poor health, I avoided getting into any detailed discussions on political matters,” he told reporters. In an alliance, all constituents have to be ready to make some sacrifices, the former chief minister said. “We are not at all insistent on a particular number of seats in Lok Sabha polls, and though we maintain that we are in a good position in at least 20 out of 40 in the state, we will work for the ‘Mahagathbandhan’s’ victory even if we end up fighting not a single seat,” Manjhi asserted. The seat-sharing may turn out to be a tough task as leaders of the six opposition parties are expected to demand a bigger share.